Women pursuing longer, thicker eyelashes no longer have to spend money and time on makeup and lash extensions. Dr. Patrick Aiello offers prescriptions for LATISSE® at his Arizona ophthalmology practice for patients whose own eyelashes are inadequate, a condition called hypotrichosis. LATISSE is an FDA-approved medication that actually includes the same active ingredient (bimatoprost) that Dr. Aiello uses to treat glaucoma. This link makes it desirable to have an ophthalmologist such as Dr. Aiello oversee your prescription use. Ready to find out whether you're a candidate for LATISSE? Dr. Aiello has 2 Yuma County offices for your convenience. Request an appointment online or call (928) 782-1980 to schedule an appointment. What can LATISSE do for me? 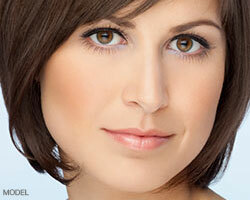 Under Dr. Aiello's care, LATISSE can gradually enhance the thickness and length of your eyelashes. Longer, darker lashes can make your eyes look bigger and improve your overall appearance. LATISSE is a solution that is applied daily at bedtime to the lash line of the upper eyelid. It isn't designed for use on the lower eyelids. It's important to follow the instructions you'll receive with your prescription and use the specially designed, single-use applicators that come with the medication. You will see some improvement after 8 weeks of daily use, but it usually takes about 4 months before the full impact of LATISSE appears. You can prolong your results if you continue to use LATISSE, but if you stop using the medication, your eyelashes will gradually return to their natural appearance. Yes. It was approved by the FDA after several clinical trials, and it is the only approved medication that is scientifically proven to grow longer and thicker lashes. Some side effects have been noted in a small percentage of cases, including itchy eyes and darkening of the eyelid skin.